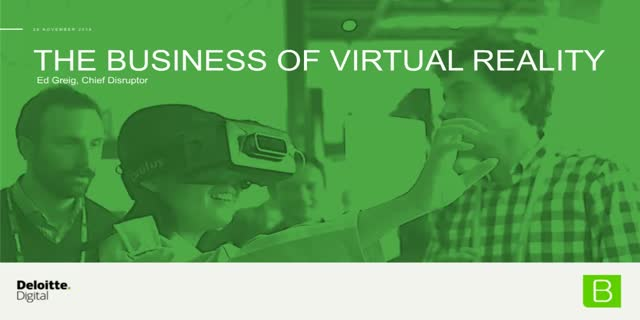 Ed Greig will be talking about how Deloitte Digital is working with clients using virtual and augmented realities today, as well as describing how these technologies are being adopted more broadly across industries. He will also describe how to assess and work with new technology so that your organisation can get the most out of it before your competitors do. Apple and Google have joined the call for an Augmented Reality future, bringing hundreds of millions of users with them. Given multiple visions for the massive opportunity ahead, how should we divide our efforts? In this webcast, you’ll hear expert opinions from a group living this challenge. VR/AR Association Marketing Committee Chair John Buzzell and YOU ARE HERE technology lead Ricardo Olivo will reveal their journey – from Vuforia and HoloLens to ARKit and beyond – covering use cases, technology insights, hardware challenges and more. You’ll learn where to place your bets, and how to make the most of this transition. This session will also include 30 minutes of Q&A to help you make sense of your VR/AR options. Samantha Kingston will explore why she bet her career on virtual reality and what it’s really like running a marketing company solely for VR, looking at trends and what challenges are ahead for 2018. Virtual Umbrella is an award-winning marketing consultancy specialising in Virtual Reality. Virtual Umbrella has worked on a number of notable projects including creating a virtual reality cinema in Cannes, curating and running a technology hub as part of the Edinburgh Fringe Festival and providing immersive experiences along the BBC and Imperial War Museum. Samantha Kingston is the award-winning client director at Virtual Umbrella. Virtual Umbrella is a marketing and PR agency specialising in virtual reality. Samantha fell into the VR industry by accident but has spent her time in the industry building up her own company and working with the VR industry in the UK, Europe, and US. Samantha is an advocate for Women in tech and VR and she is often found moderating panels on equality in the workplace. In 2016 she won the regional and national ‘New Business’ award at Venus Awards, highlighted as one of MCV 30 under 30 and one of the rising stars of BIMA100 2016. Multiple friction points along this journey make us ask “So What?” when it comes to the immersive visual experience. content library and web editor to pass the ‘So What?’ test. We enable brands to create immersive, affordable visual experiences that deliver longer term campaign value that are engaging and easy for consumers to enjoy. Spend 1hr with Robert online and ask any question you want! Robert will present the latest industry information and give you insights into the present and the near-future. Robert Scoble is on the Advisory Board of the VR/AR Association and is an authority on what's next, particularly when it comes to VR, AR, and MR. Partner at Transformation Group, Robert helps companies deal with the disruption that next generation augmented reality, AKA "Mixed Reality" represents. In his book, "The Fourth Transformation," he details how it will change everything from retailing to education to sports. Robert received several endorsements: Time: One of the top 140 Twitterers! FT: One of the five most influential Twitterers! Inc.: Top 5 on list of Tech Power Players You Need to Know. Next Reality: Top 50 AR influencer. As the digital experience proliferates in everyday life and we begin to migrate into the new virtual reality medium, how do we create the most human and organic digital experience? Moving forward, digital devices not only grow smaller and closer to the body, but daily use time explodes. The challenge is using design strategies around user experience to mitigate consumer pain points to allow for seamless immersion in your experience or VR product. We will talk about how about how design must be incorporated as a process and strategy in VR builds for success. Join us April 27th for a panel discussion on how to put the human first while creating for Virtual Reality. Part of the VR/AR BrightTALK Summit, our panelists will exchange on how to take user and audience in consideration during the Virtual Reality creation process. As Virtual Reality is getting more and more exposure, it is time to highlight the right practices of designing a Virtual Reality project and see what we can do to put the human first. - Do Virtual Reality creators consider the audience they address before/while developing their projects? Why is this crucial? How and when to do so? - Are we more careful today to offer more accessible VR experiences than a year ago? - How is this evolving? Do studios and creators tend to integrate more the human in the creation process? The panel will be led by Amandine Flachs, Events and Communication manager at the Realities Centre. She will be joined by a variety of Virtual Reality leaders, including creators, game developers, agency and B/B professionals. - Doug North Cook - Creative director and co-founder at Decoder. Brandon Birckhead is a physician who founded Immergence Technologies, LLC, a company to help dentists use virtual reality in their practice and collaborate with developers to create tailored content. He is also the coordinator of the VRARA Digital Health Committee. Current research focus has been on exploring the immersive effect of different VR applications. He graduated from Mayo Clinic Medical School in 2016. Augmented, mixed, and virtual reality compose a spectrum for next-gen computing that is disrupting or accelerating the business objectives of companies across almost every industry. With an ever growing number of pilots and available solutions, it is imperative that businesses develop a strategy of where to play and how to win, while avoiding technology for technology’s sake, in order to create new value. Jiten Dajee is a subject matter expert on digital reality technology spanning the entire value chain of augmented, mixed, and virtual reality. Jiten has been involved with Digital Reality technology since his first joint-venture in healthcare wearables in 2011. He joined Deloitte Consulting Innovation to lead the rapid commercialization of digital reality across industrial and commercial sectors. He brings an end-to-end understanding of how optics, networks, semiconductors, platforms, products, and will interact in the next-gen computing medium. Jiten specializes in market intelligence, technology adoption, solution integration, and strategic growth planning of digital reality in enterprise. While many companies and institutions understand the need to investigate AR and VR, the path to success is a long one. Often, there are several teams at a single company looking at ways to leverage this technology, for internal processes as well as customer- and consumer-facing solutions. Enterprise is the best starting or entry point for AR and VR because the pain points are high, the dollars are there to make a strong ROI case for use, and the wearable form factor is much less of an issue. AR and VR technologies will be instrumental in closing the skill gap that is responsible for the shortage of skilled manufacturing workers. We are optimistic that industrial productivity will grow and that this will ultimately translate into higher wages because AR and VR will allow more workers to do high-skill jobs, and improve their performance. This live panel will set the scene for augmented reality (AR) in business; what are the use cases? Who's beginning to adopt the technology? Where are we seeing success? The panel of experts will then discuss areas of growth and the challenges that lie ahead. The panelists will try to break through the surrounding hype and discuss in detail the true potential and challenges for AR when business look towards adoption. This presentation will look at the new opportunities being opened up for the visualisation of data within both personal and collaborative 3D spaces, delivered to mobile, browser, desktop, virtual reality and social virtual world/social virtual reality environments. The pros and cons of both 3D and VR environments for the creation and sharing of data visualisations will be considered, tools which let you do dataviz in 3D and VR today presented, and future development pathways discussed. The newest VR Intelligence survey clearly shows that the lack of engaging content is holding the industry back. On the other hand content creators need better distribution of VR/AR headsets. In comparison we can ask ourselves: 'how much would I pay and what kind of mobile phone would I buy if it would not allow me to have video calls or take pictures and share them live on my social networks'? EF EVE™ is a live holographic streaming engine which is changing the industry by bringing real time 3D VR/AR experiences. Just imagine putting on your VR/AR glasses and in a split second traveling miles to visit your friend in New York or standing next to Ed Sheeran during his performance in Brazil. Lets have a live demo of EF EVE™, and discuss the future of live 3D events for VR/AR. The new age of immersive digital media is just beginning. As we start to transition from flat 2D displays of the smartphone to the immersive 3D displays of VR/AR, brands have new opportunities to leverage the power of this new medium to better tell their stories and connect with their audience. Content Creation & Production that drives User Engagement because you Experience the Content. George Egbuonu is the founder of VR eCards a VR platform and content creation tool that allows you to personalize and share a virtual reality experience instantly in the form of a VR eCard. He is a technology entrepreneur and product centric visionary with both a mechanical engineering and MBA degrees. He is also a bestselling Author and a movie producer. A mixed-reality world driven by intelligent systems would have to be observing behavior and sensing physical phenomena continuously in order to provide individuals with appropriate content. Is that a sensible trade-off or a dance with the devil? Does the sensing possible with these technologies allow for ways to level the playing field or does it exacerbate existing power inequities? If the AI-enabled world of the future is monetized with personal data, then surveillance might well be baked into the system, but the ethical issues we see today will only be amplified in an immersive environment. Join this discussion with Monique Morrow, CTO & Chief Technology Strategist, President & Co-Founder of the Humanized Internet, for an in-depth look at what a true MR/AR/VR world means. Humans have shared gathered around and communicated through stories throughout history. Text, pictures, images and videos have sought to capture our imagination, or portray the non-fictional in a relatable way. Now, as we move beyond the 2D flat screen to new ways of interacting/communicating with the world — virtual and augmented reality, for example — we begin to see the power of immersion in storytelling, and the impact it has, beyond anything we have ever seen, on those in the receiving end. Arguably, the ultimate empathy machine. As we shape the next 'Information Age', and given the state of the world today, never before have we been in more need of putting ourselves in other people’s shoes, and empowering diverse and inclusive voices worldwide. Never before have we seen more women jump at the opportunity to lead and make content that is all-encompassing, that touches and inspires, and that aims to build bridges not walls. Here is their story. Learner, maker, systems thinker, innovator and tech evangelist, Luciana splits her time between growing the Realities Centre London — a new innovation space, incubator and academy for B2B/enterprise VR, AR, MR and AI — and Unfold UK, promoting women/diversity in future in the UK. Passionate about VR and tech for good, she carries ongoing research on the possibilities and challenges immersive tech presents as re neuroscience, empathy and female empowerment. She was elected one of Code First Girls ‘25 Ones to Watch’, 'Top 5 Female Role Models in the Tech Industry', and Virtual Perceptions' 'Heroes of VR' in 2016.
cognitiveVR is an analytics platform built for virtual and augmented reality. In this webinar, cognitiveVR’s Director of Product, Robert Merki, will showcase how you can leverage analytics and data to understand how users interact with your virtual worlds. Will Virtual Reality connect us to the world or separate us? Join world creator Rob Crasco and speaker Ryan A Bell for a special live discussion on immersive media, tipping points and the future of creating. In this session you’ll learn how to get started in VR, the mentality of the future creator, building worlds and, of course, what will happen in the future. This channel is for Augmented Reality, Virtual Reality and Mixed Reality professionals, content developers, app developers, software engineers, hardware engineers, architects, sales professionals, marketing managers, project and program managers, and anyone else who is interested in AR and VR technology. With Microsoft HoloLens, Facebook's Oculus Rift, HTC/Valve's Vive, Project Morpheus from Sony (Playstation VR), Samsung Gear VR, and now Magic Leap, (to name a few - the list is getting longer all the time!) there's no getting away from the fact that AR and VR have arrived!